Softback zine laser printed in colour on ivory paper. A5 size with 20 printed pages, saddle-stitched. Day-Glo cover, laser-printed in colour. Brighton, February 2017, edition size of 30. Is it even worth reading the news? Why aren't alternative facts lies? who knows, this zine won't help you one little bit. Featuring the Blue Bird of Happiness and Autocorrect. Download to your on Kindle or e-reader (whatever they are). Great to see all the issues of Future Fantasteek! 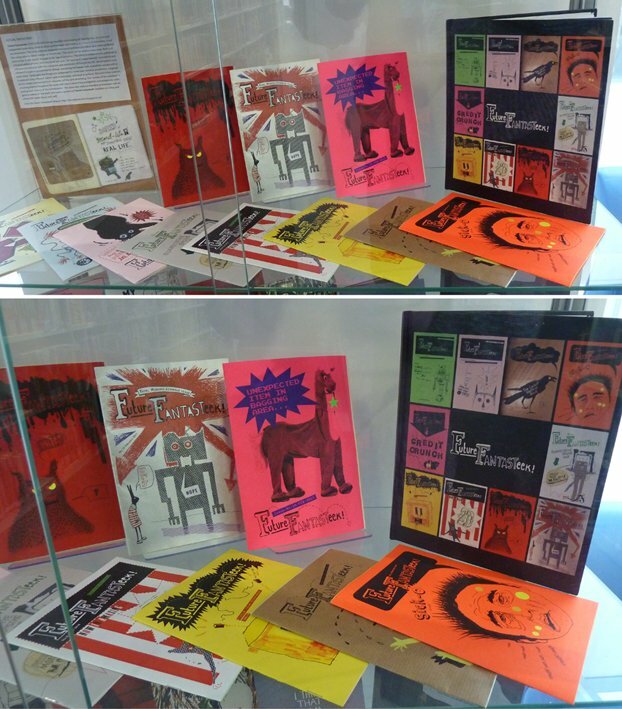 on display in the UWE Library this month. Photo courtesy of Sarah Bodman, display by Steve Norton.